Click the photo above (or here) for a photo gallery of Wednesday’s practice from photographer Brad Graverson. 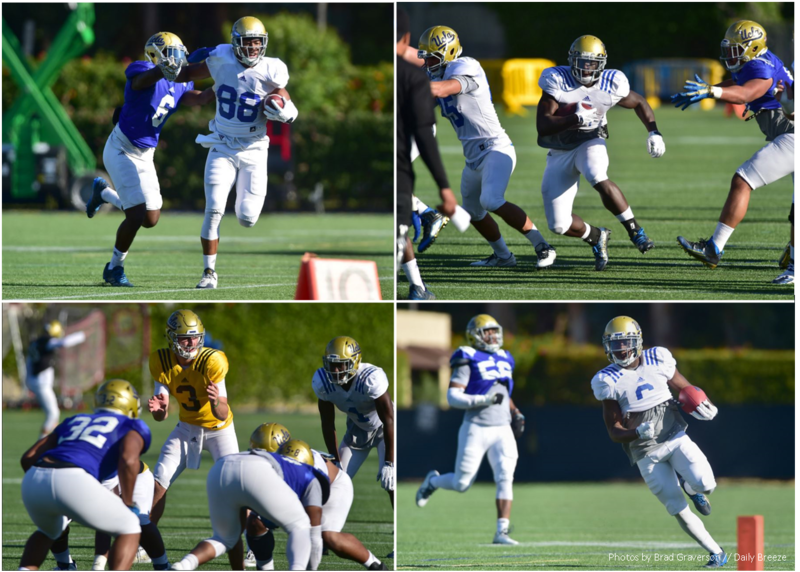 Above, from clockwise from upper left: tight end Austin Roberts; running back Bolu Olorunfunmi; wide receiver Stephen Johnson III; quarterback Josh Rosen. Soon to come HERE is a notebook coming about Theo Howard, who made his media debut Wednesday, and the returns of Mique Juarez and Josh Woods. Here are video interviews with Howard, Woods, Deon Hollins and Cameron Judge. Here is the practice report for the day. Why are practice jerseys different than the game jerseys?